First off, be honest to yourself. It’s the layer that is closest to your skin and so, if it doesn’t feel good or doesn’t offer adequate support, it’s time to change. Even some signs are clear enough to show that you are wearing a wrong pair of underwear. For example, if the leg bands are sinking into your thighs, you are probably wearing a too small size. Or if your waistband is constantly slipping below your trousers every time you bend, you are either wearing a too big size or the elastic has completely ruined (and so, it’s time to throw it away). Here are a few useful tips for men to choose just the best men’s underwear 2018. These are the best for guys with larger thighs (and also those who, umm, more well-endowed). Forget those old briefs you or your mom used to buy for you. The new designer brands today are sleeker and modish. They are the best for guys with bigger thighs. They are also good for shorter guys since they expose your legs more making them appear longer and hence taller. If you don’t wear slim jeans or suit trousers regularly, boxer shorts will offer you highest breathability and they are way less revealing than anything else. However, they are a bit costlier and also offer very little support. 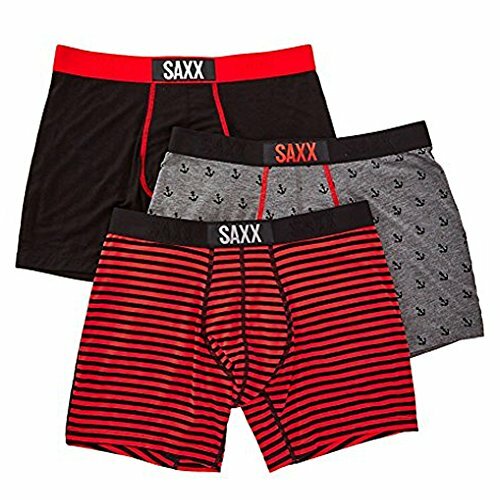 As their name indicates, boxer briefs are the favorite of boxers and briefs: they have a shape of a traditional boxer short but are cut on a more fitted block out from a jersey material. Since the advent of slimmer silhouettes in menswear during the last decade, boxer briefs have become a go-to style for most guys. Perhaps it is the most versatile style of underwear, not as exposing as briefs but providing total support. Trunks are the latest style of underpants and are a shorter version of boxer-briefs that has become popular with the advent of ultra-skinny trouser styles. They tend to be of mid- to upper-thigh length. Usually they are flat-fronted, though sometimes may have a keyhole fly and sometimes may include an added pouch of fabric for added support. Thus, there is something for each guy and he should choose the right one for him if he wants to look and feel relaxed, confident and easy-going.